In 1978 due to the presence of dry rot it was decided to demolish the eighteenth century Ashtown Lodge. The lodge was first used as a residence for the British Under Secretary and later by the Papal Nuncio up until 1978. 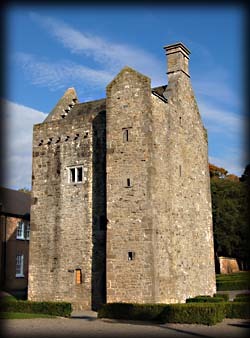 During this process the even earlier medieval tower house known as Ashtown Castle was discovered within the structure of the lodge. The fully restored building is dated to around the 16th century but may be even earlier. Next to the castle is the Phoenix Park Visitor Centre that houses an exhibition showing the history of the park. Situated: In the Phoenix Park. Head west on the main road through the park turning right and then immediate left at the Phoenix Monument, follow the road through the white gates up to the car-park. Discovery Map 50: O 1111 3636. Last visit Oct 2007.